Content: Content: [Cz. 1.] 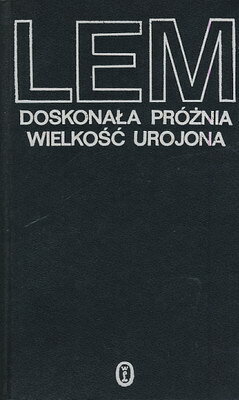 Doskonała próżnia: Lem S. "Doskonała próżnia"[autorecenzja]. "Les Robinsonades" par Marcel Coscat(Ed. du Seuil - Paris). Patric Hannahan "Gigamesh"(Transworld Publishers - London). Simon Merill "Sexplosion"(Walker and Company - New York). Alfred Zellermann "Gruppenführer Louis XVI"(Surkampf Verlag). "Rien du tout, ou la conséquence" par Solange Marriot (Ed. du Midi). Joachim Fersengeld "Perycalypsis"(Edition de minuit - Paris). Gian Carlo Spallanzani "Idiota" (Mondadori Editore). "Do yourself a book". Kuno Mlatje "Odys z Itaki". Raymond Seurat "Toi"(Ed. Denoel). Alistar Waynewright "Being Inc."(American Library). Wilhelm Klopper "Die kultur als Fehler"(Universitas Verlag). Cezar Kouska "De impossibilitate Vitae"; "De impossibilitate prognoscendi"(2 tomy), (Praha, Statni Nakladatalstvi N. Lit.). Arthur Dobb "Non serviam"(Pergamon Press). Alfred Testa "Nowa kosmogonia"(Tekst przemówienia, wygłoszonego przez profesora Alfreda Testę podczas uroczystości wręczenia mu nagrody Nobla, wyjęty z tomu pamiątkowego "From Einsteinian to the Testan Universe", publikujemy za zgodą wydawcy. J. Wiley and Sons). This page was last edited on 9 December 2011, at 14:41.